One of the many things I look forward to every Fall is all the different varieties of squash. I am a self proclaimed squash whore. Don’t judge me. It’s a sickness, a sickness I say! I don’t recall us ever having squash when I was a kid (though back then, I highly doubt there were many to choose from ANYWAY; probably acorn and that was about it. ), it was something I got pulled into trying about a decade ago. How? The sheer prettiness of the vegetable. Acorn squash with their shades of green and orange, Butternut, but especially my two favorites, Delicatas and Sweet Dumpling Squash. Those two are just so pretty to look at that you can’t help but want to eat them. I love them best with just butter and salt (we totally won’t talk about how much butter I use), but Winter squashes are also so darn good used in recipes. I also have a thing for stuffing. It’s one of the dishes on Thanksgiving that I pig out on. So I decided to mesh two of my favorites into one. 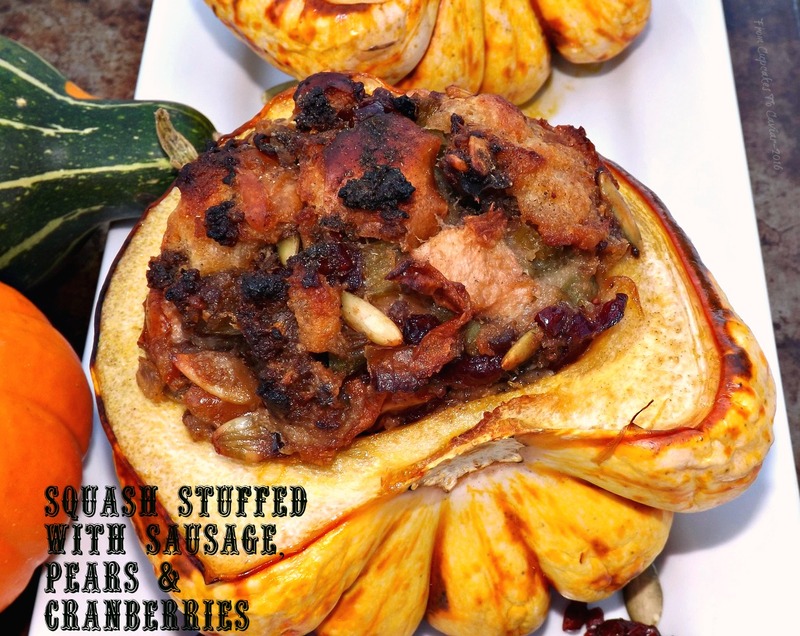 I’d seen stuffed squash before, but I had no interest in one with feta and llama toes or one with calcified dinosaur eggs and balsamic covered hickory nuts. I wanted something a bit more traditional but with a twist. So I went back to the fruit I have already called underappreciated; the pear. They are so delicious this time of year but they get ignored in favor of apples and pumpkins! We need to start a Facebook page for pear lovers! #pearloversunite Or…erhmmm, something like that. So I stuffed a big meaty sweet dumpling squash with a buttery, crispy mix of sage sausage, chopped pears, dried cranberries and roasted/salted pepitas. Those, with some cubed French bread (use whatever bread makes you happy) and seasonings (including cinnamon, which added a wonderful Fall note to the filling) made this into a fantastic light meal. It makes a lot of filling, enough for two large squash (4 people), so if you don’t need that much, feel free to freeze the rest in a air tight container or just make the rest in ramekins. I did that because my husband, weirdo that he is, doesn’t care for squash. He loved the stuffing, however. Using a large pan, break up the sausage and cook until well browned. Scoop out the sausage and set aside. Without draining the fat, add in the onions and celery and cook over low heat until softened. Add the sausage back in and stir well. Add in the pears, cranberries and pepitas along with the butter and half of the chicken broth and stir just until the butter melts. Toss in the bread; stir well. Add in the sage, cinnamon, salt and pepper. Stir to combine and give it a taste for seasoning. Add more broth if you want it moister. Add a touch more sage if it needs it, more salt, what have you. Spoon the stuffing into the squash, packing it down firmly. As I mentioned in the post, if you aren’t using it all in squash, you can either freeze the extra in a tightly covered container or bake the extra in greased ramekins. Bake at 350 until a fork easily pierces the side of each squash half. If the stuffing is getting too brown for your tastes (I like it nice and crispy, myself), cover the squash with foil. When done, feel free to shove a pat of butter down in the middle of the stuffing. I won’t judge. Serve; enjoy. I love to scoop a little of the squash into every bite of stuffing; others like to mix it all together. No matter how you choose to enjoy it, it will be delicious!